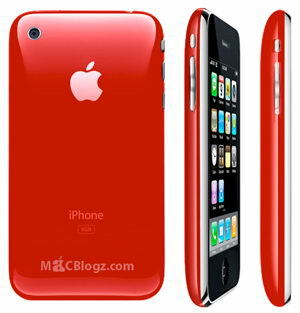 Rumor has it that around the Holiday Season, after the hype of the iPhone 3G launch is starting to simmer down but in time for the Christmas rush, Apple will be releasing a red iPhone 3G. This is not the first time we will have seen a red product by Apple. The iPod Nano and Shuffle currently have red versions as a part of the (PRODUCT) RED campaign by Apple, which aims to support the fight against AIDS in Africa by giving “a portion of the purchase price to the Global Fund to fight AIDS in Africa.” You can learn more about (PRODUCT) RED HERE on Apple’s Website. Could be a rumor…could be true?! I actually kind of like the red. Let us know in the comments what you think.